Easy to use network server monitoring tool. Monitor servers from your desktop. Simple Server Monitor 2.0.5 is network monitoring software developed by Tartanleaf.com Inc.. 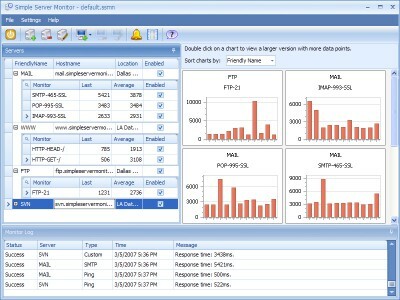 Simple Server Monitor is a powerful, yet easy to use network server monitoring utility. It allows you to monitor the status of your servers and web applications from your desktop. 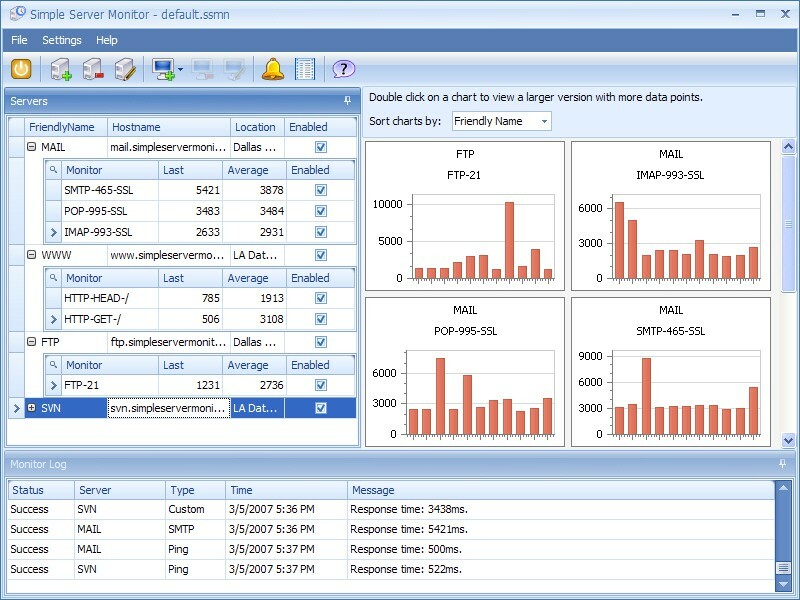 Simple Server Monitor runs as a Windows Service with GUI monitoring console. When a monitor fails, you are notified by a pop-up message, an e-mail alert, and/or a sound alert. Charts monitoring performance. Supports Ping, HTTP, FTP, SMTP, POP, IMAP, and Custom monitors. This program is shareware, which means you can download and use Simple Server Monitor 2.0.5 for free during 30-days trial period. After this period you gonna have to buy Simple Server Monitor 2.0.5 software for $69.95 or uninstall the program. Simple Server Monitor 2.0.5 supports English interface languages and works with Windows XP/Vista. We have tested Simple Server Monitor 2.0.5 for spyware and adware modules. The software is absolutely safe to install. Our website has thoroughly tested network & internet product Simple Server Monitor 2.0.5, written the review and uploaded installation file (6440K) to our fast server. Downloading Simple Server Monitor 2.0.5 will take minute if you use fast ADSL connection. Website Monitoring Software to monitor the status and performance of websites. ServerRadar is a powerful and easy-to-use website monitoring software.